Easy enchiladas with black beans and spinach. The enchilada sauce and filling are both simple to make- no precooking required! Just mix, roll, and bake. “Easy ” is not necessarily the category I would assign enchiladas in the grand scheme of kitchen projects. 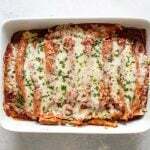 Many versions require multiple cooking steps like making and cooking the enchilada sauce, chopping and cooking the filling, and then baking the enchiladas in the oven. 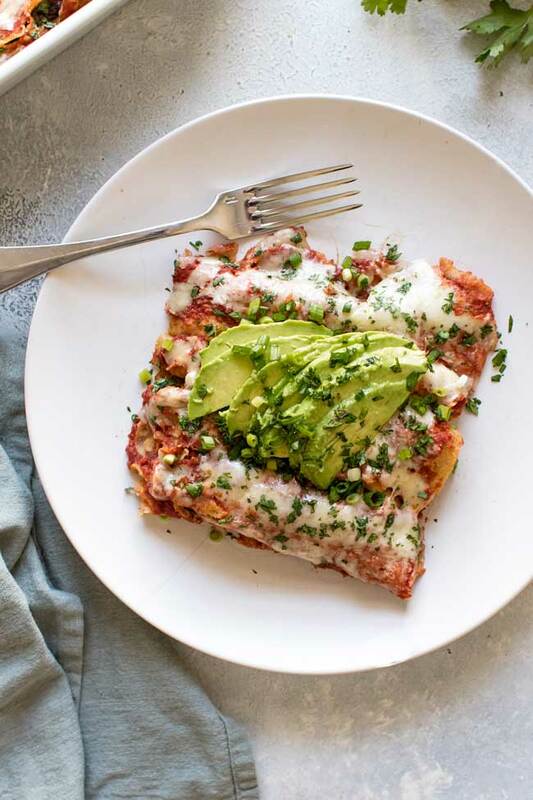 Yours truly is guilty as charged as I’m pretty sure there are a few high-maintenance enchilada recipes buried in the archives. So, these enchiladas with black beans and spinach are like a breath of fresh air. There’s no precooking required – all you do is mix, roll, and bake. A lot of from-scratch enchilada recipes require some kind of pre-cooking activity whether it’s the meat or the enchilada sauce. Because these are vegetarian you don’t need to break out the skillet to brown meat and instead of simmering the enchilada sauce you just mix it up and pour it over the enchiladas. It cooks in the oven along with everything else. You’ll want to thaw a box of frozen spinach first, which takes about six minutes in the microwave. While it’s thawing, mix up the rest of the filling which is just black beans, lime zest, salt, and shredded Monterey jack cheese. Once the spinach is thawed, and this is an important step, place it in a clean dish towel and squeeze out all the moisture. You don’t want all of the liquid in your enchiladas. Add the spinach to the black bean mixture and the filling is done. The enchilada sauce is as simple as combine tomato sauce, chili powder, onion and garlic powders, dried oregano, salt, and lime juice. Just mix it up and it’s ready to go. I like to add about a 1/2 cup of the sauce to the filling. I used 7-inch corn tortillas for these enchiladas, but you can use flour tortillas if you like those better. At this point, all you need to do is assemble the enchiladas and place them in a baking dish. Pour the sauce over the top, sprinkle on some shredded cheese, and cover the dish with foil. Bake the enchiladas for 30 minutes at 375°F. Uncover the dish and bake them for another ten minutes, or until the enchiladas are hot and bubbly. Don’t forget garnishes! I like cilantro, avocado, and green onions on mine or dress them up with all of your favorite toppings. Post, recipe, and photos updated from the archives. First published September 2016. 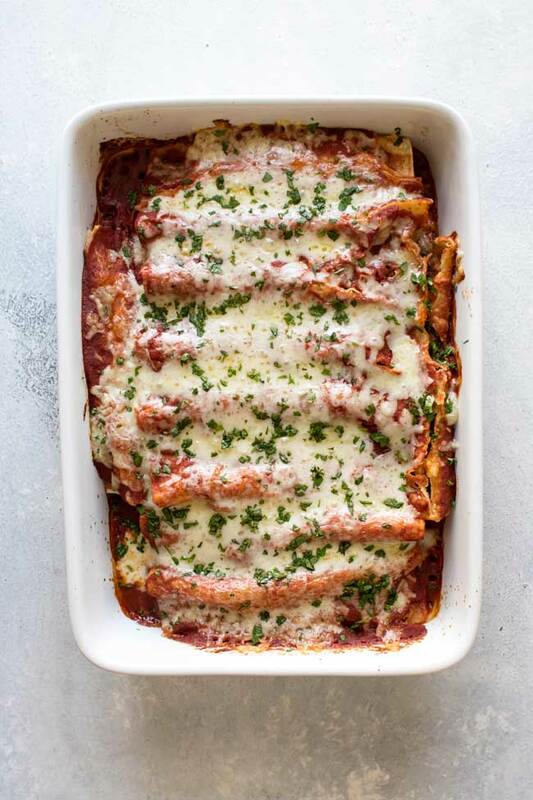 I love enchiladas and easy too!